The Eiger Trail 2017 trip was an awesome week of trail running in the Berner Oberland and reconnaissance for a bunch of trail runners from around the globe. Not all of us raced, but those who didn’t ran around enough, cheering everyone else! We came together in the idyllic mountain village of Mürren, where for two days we ran around the Swiss hills, stopping at places like Obersteinberg—where the coffee has milk just about right from the cow’s udder to you! En route, we stopped at the ballroom for a tremendous view of the Jungfrau Alps, in one of the few flat spots around! Then we had the run across to Grindelwald, where for an excuse to get ready for the Eiger Ultra races, we opted for some more bucolic tours around Swiss slopes. We had competitors in every category, except for the 101km, and good weather conditions. All racers had a fantastic time, and some exciting results—including one self-admitted DNF. (Sorry, Donkey!) To be fair, Mark was just following the other runners, who apparently wanted additional views. 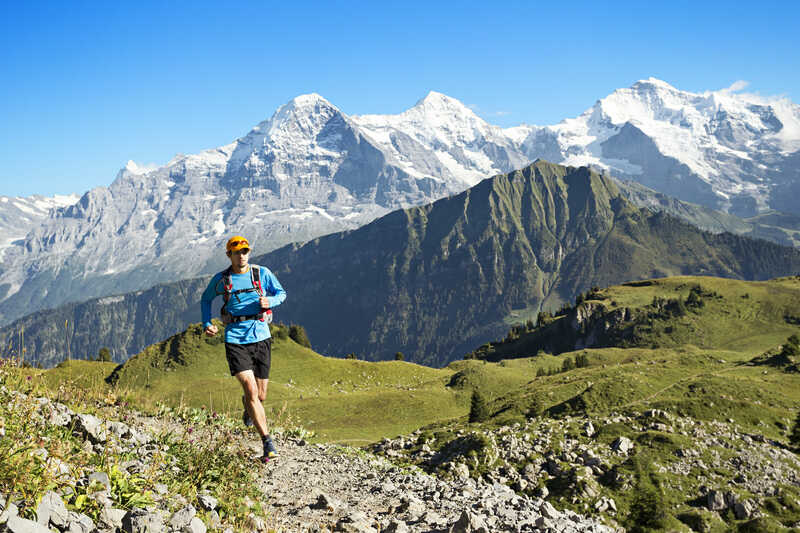 Although a serious event, the Eiger Trail trip was not all about the running. We had some fantastic scenery, places to eat on route and managed to chat about every topic under the sun. I think we all found it to be a most rewarding and fun-packed week. It was a week to remember! My thanks to Jerry & Jeri, an amazing couple who just finished a Run the Alps Tour du Mont Blanc trip before heading over, Mark (aka Donkey) and Joany who constantly wanted extra thrills, Charles, Lotta, Jeanne and the pop-up self-guided crew of Dessa and Chase, the latter of whom we all wish a happy 18th! Hope to see you next year guys! Traversing across towards the Bachalpsee with the North Face of the Eiger shrouded in clouds, just after spotting some Ibex. Dessa looking very, very happy to have completed her 16k Eiger Ultra Trail race—as she should. Nice going! Lunch at the Waldspitz Hutte with great food to be had. Plenty of happy faces and a few heavy stomachs for post-lunch trail running!